Are you 7-12 years old? Are your school snacks getting boring? Do you want to learn to cook/ If so, "you're the Chef" is just for you! Registration is required. 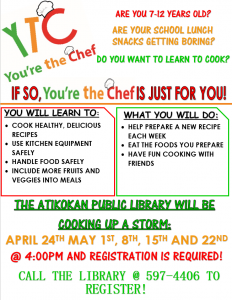 Call the Atikokan Public Library 807-597-4406 for more information and to register.